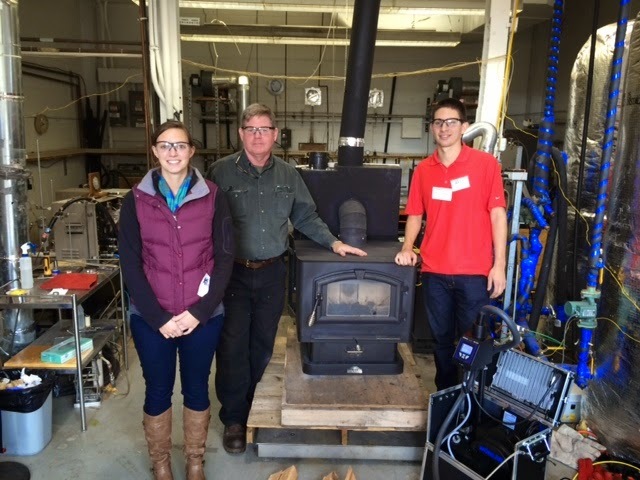 The University of Maryland Extension Woodland Stewardship Education program will host a one-hour webinar on Thursday, December 4th from 12:00 p.m. to 1:00 p.m. to provide an overview of the “best practices” in wood and pellet stove incentive programs across the United States. As renewable energy programs grow around the country, more and more states are including incentives for wood or pellet boilers and stoves. 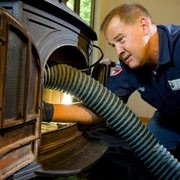 Unlike other household appliances, such as refrigerators, furnaces or washing machines, wood heating equipment have no “Energy Star” labels for consumers to consult to make energy efficiency comparisons. Consequently, several states have devised a range of methods to determine the eligibility of cleaner and more efficient stoves and boilers. This webinar will explore the features of these programs, and will use Maryland’s stove incentive program as an example of how one state met its goals for ensuring consumers purchase the most efficient appliances available. The speakers will identify what they see as emerging best practices in stove and boiler incentive programs as these initiatives become more mainstream. 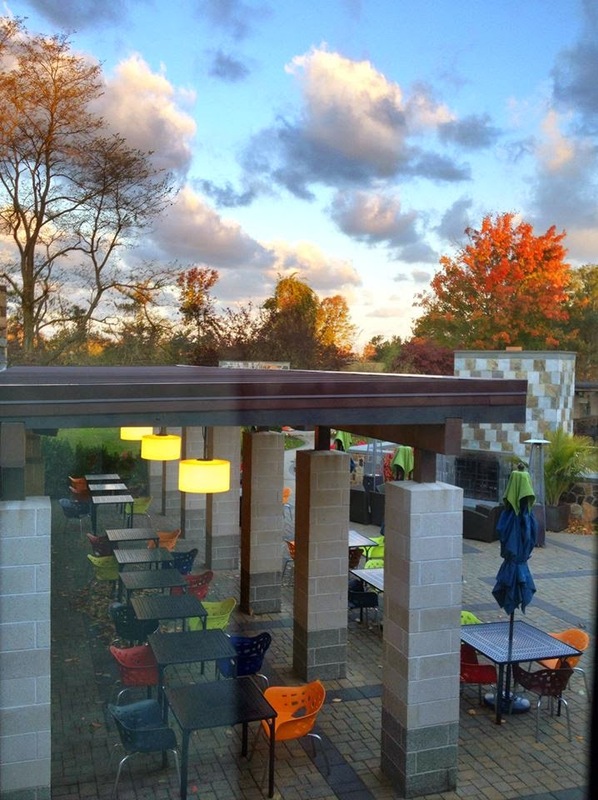 This webinar features presentations from Jonathan Kays, University of Maryland Extension Natural Resource Extension Specialist; John Ackerly, President of the Alliance for Green Heat; and Emilee Van Norden, Clean Energy Program Manager of the Maryland Energy Administration. The webinar is free and open to the public. Sign up now to reserve a spot. Part of the Workshop rules was a requirement that teams had to publicly share their test results, which is a key part of the collaborative and educational process. During the Workshop, each team presented their test data to the 50 attendees who had the opportunity to discuss the results and give feedback to the team. 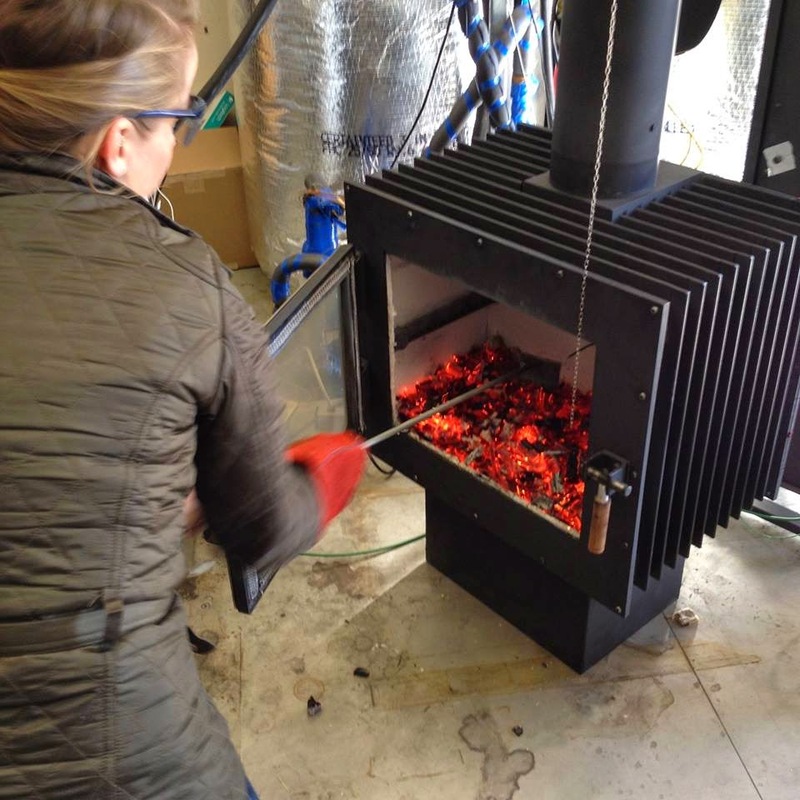 Unlike EPA test, which starts when the stove is already hot, we used a warm start, capturing some start-up emissions, we used cordwood instead of crib wood and we used higher moisture content wood. Note: any gram per hour (g/h) references in the below test results are not comparable to g/h values from EPA test labs because we did not follow the Method 28 test protocol. 1. MF Fire, the Mulciber. Powerpoint link. 2. The Kleiss stove. Powerpoint link. 3. Wittus Twinfire, Powerpoint link. 4. The VcV, PDF link. 5. Catalus Ventus, PDF link. Each team presented the concepts and technologies in the stoves. For a brief technical overview of all the stoves with contact info for the Teams, click here. During the Workshop, there were a series of expert presentations and webinars about automation, traditional stove technology, public health implications, air quality, regulatory issues and other relevant topics. 2. Webinar with the five teams, hosted by BTEC. Feedback Survey: Results of a 10 question feedback survey about the Workshop by teams, participants and organizers. 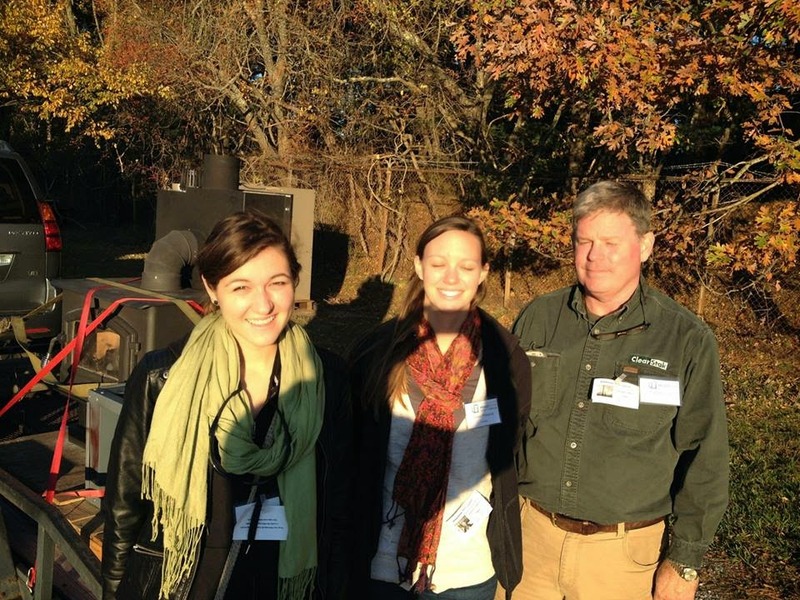 Ivana Sirovica, Jessica Peterson and Jeff Hallowell, from ClearStak Brookhaven National Laboratory. Rebecca raking coal bed to prepare for the next load of fuel. 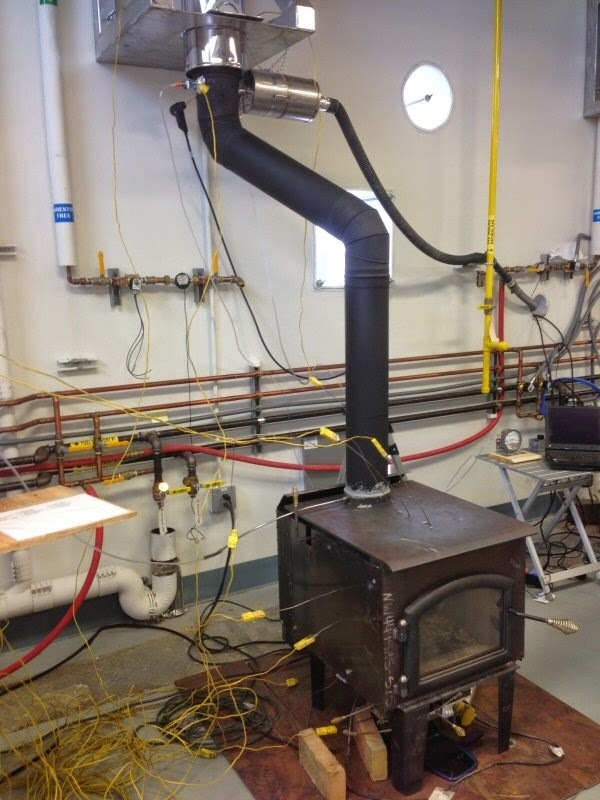 Thanks to John Pilger and Chimney Safety Institute of America and Olympia Chimney for donating pipe and installation! 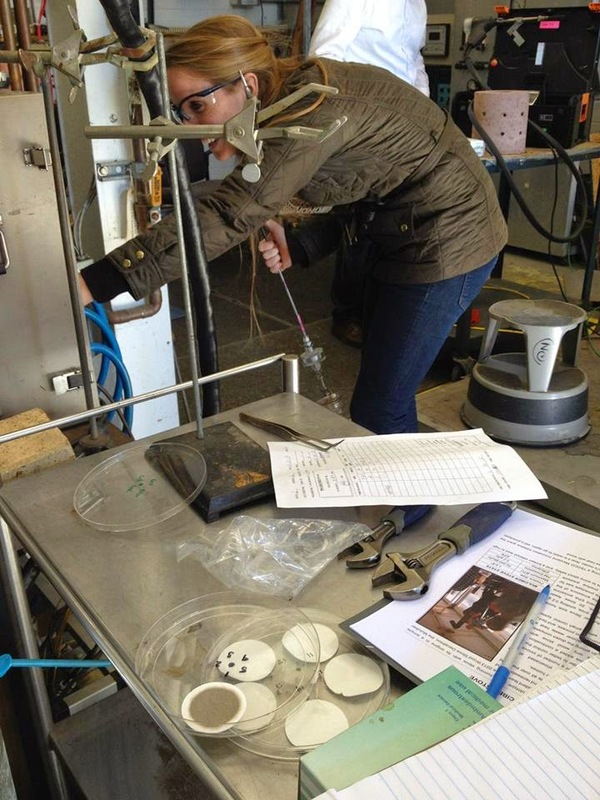 Rebecca Trojanowski removes filters. The dark circle in foreground are the particulates on a filter from the test burn that will be weighed to determine grams per hour. Even the kindling is carefully weighed so that each stove gets the same warm up rick. Jessica Peterson from ClearStak working late into the night to prepare for testing tomorrow. 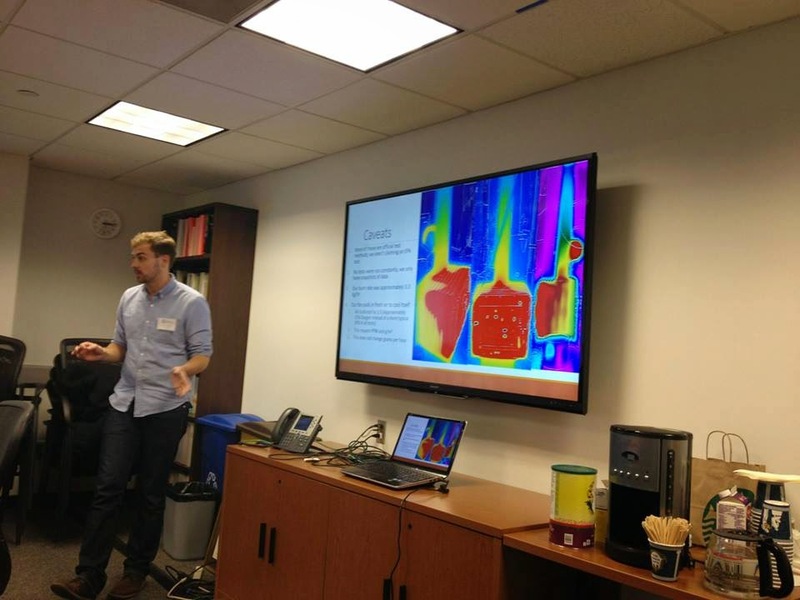 Taylor Myers showing a thermal image of the Mulciber stove. 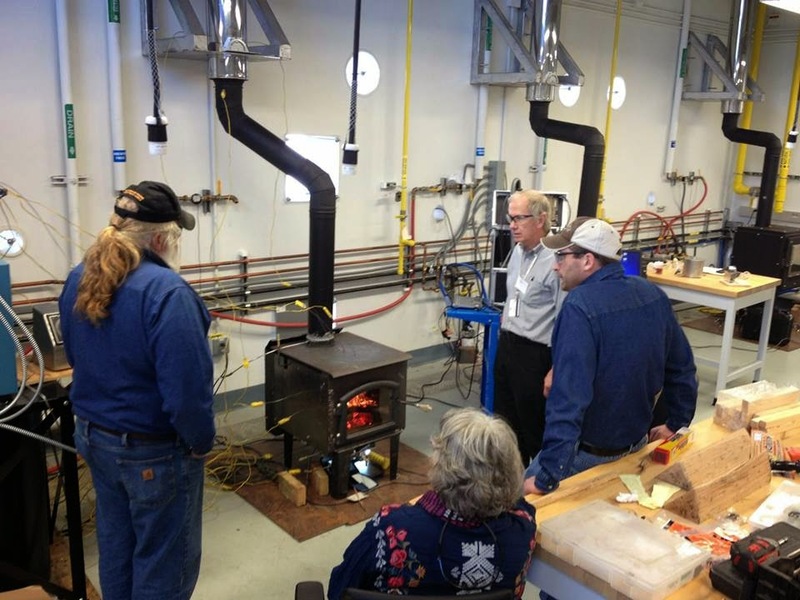 Ben Myren, Tom Butcher and Eric Schaeffer firing up the New Zealand VcV stove. Taylor Myers showing a real time digital display, using bluetooth, of temperatures in his stove. 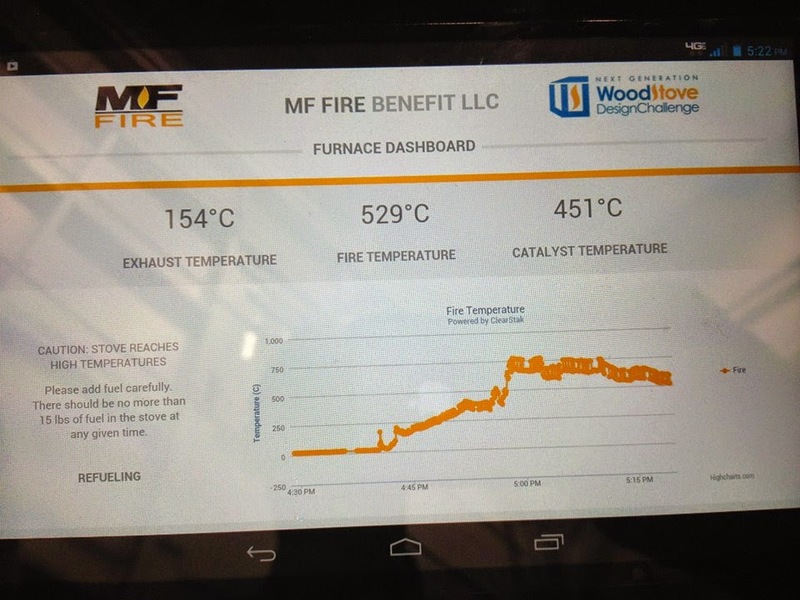 Developed by ClearStak, this real time digital display shows 154 degree stack temperature, 529 in the firebox and 451 in the catalyst. Estimated efficiencies were in the mid-80s. Glenn Miller from the Fairbanks Air District on the left, Rob Rizzo from Mass. Dept. of Energy, and Gaetan Piedalue and Marc Suave from Polytest Labs, a EPA accredited test lab. Ellen Burkhard from NYSERDA is peering into the stove. The Wittus Twinfire's downdraft mechanism, where the fire gets sucked into lower chamber and then passes through catalyts before going back up the stack. Corey Van, one of the young ClearStak staff that helped build the Catalus Ventus. Rebecca Trojanowski loads the Catalus Ventus. The new Testo moisture meter that reads moisture without "pinning" the wood. Norbert inspects the Condar, placed right below the triple walled pipe. The tube on the right of black pipe is a Condar, which operates very similarly to a dilution tunnel. 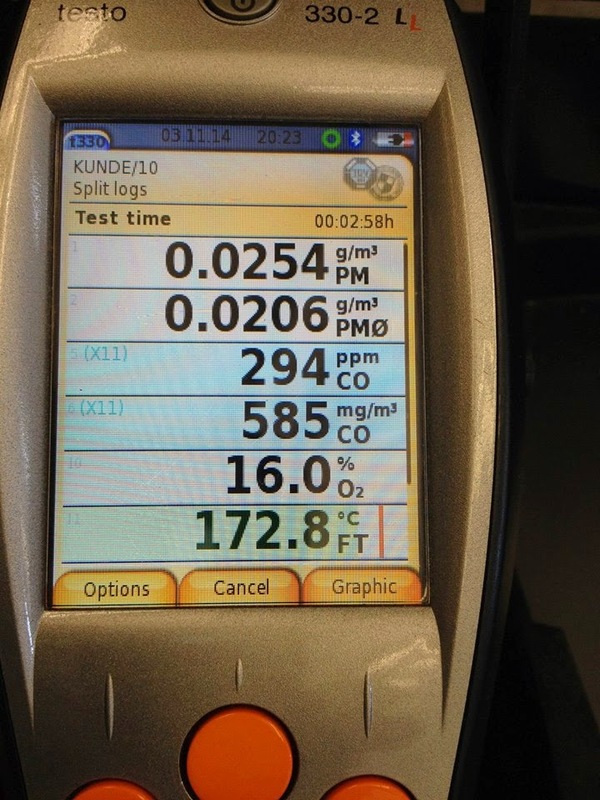 Norbert Senf is using it concurrently with the Testo PM analyzer. A warm up test load made by Ben Myren. This top down burn, with smallest kindling on top, and larger kindling on the bottom is a very efficient way to start fires. 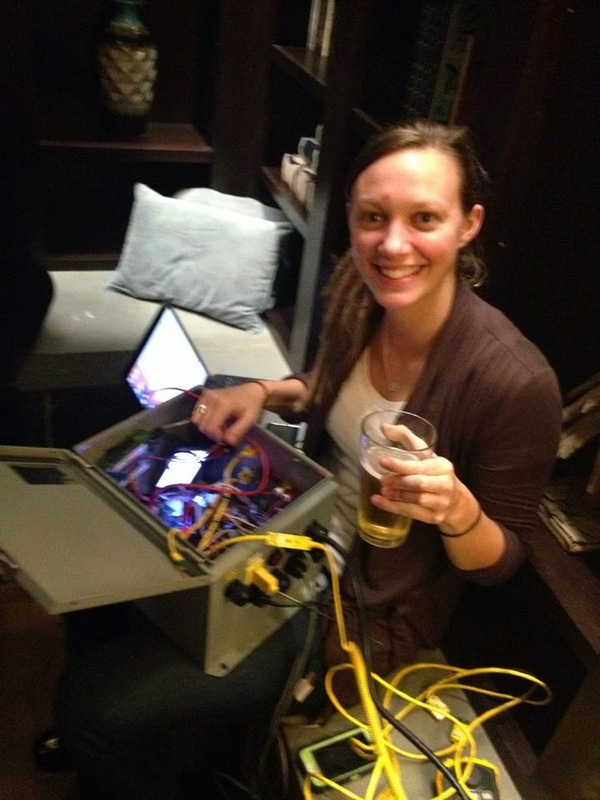 Amanda Aldridge of the EPA talks with Norbert Senf (behind flue pipe) about the Condar analyzer. Rob Rizzo from Mass. Dept. of Energy in upper right. Electronic controllers that can be put in wood heating systems that were part of Jeff Hallowell's presentation. 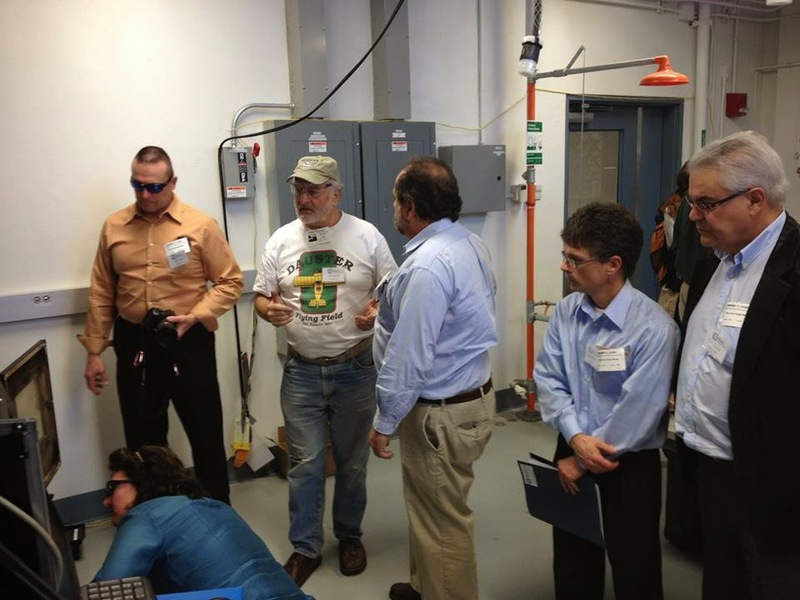 Harold Garobedian in red jacket on right, and Rafael Sanchez from the EPA behind him. A new Testo moisture meter that works without pins. It can measure moisture at the center of the wood, not on the edge. George Wei hangs almost upside down to put a temperature sensor in the top of the flue pipe to measure stack temperature. This is a key data point for determining efficiency. John Ackerly on opening day, welcoming everyone and talking about how automated stoves can solve many problematic issues issues that come with widespread wood burning. From the left to right - Ellen Burkhard from NYSERDA, Lisa Rector from NESCAUM, Amanda Aldridge from EPA and Mark Knaebe from US Forest Service. We spent hours in this room, having different presentations every hour, with lots of discussion and debate. Here, Ben Myren is presenting the testing results of the VcV stove. Brian Gauld of New Zealand, John Pilger of CSIA and Jeff Hallowell of ClearStak. 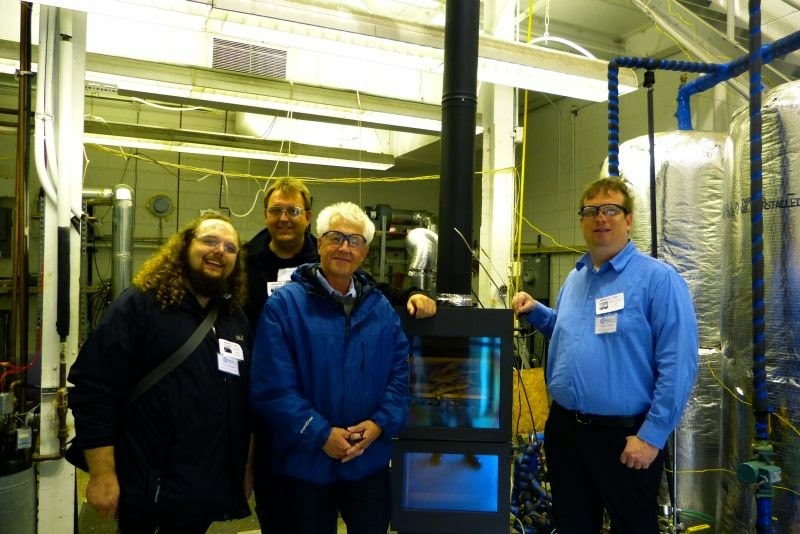 Gregory Elliiot and Peter Cullen from Wohler, and John Pilger from Chimney Safety Institute of America. Ingo Hartman, measuring glass temperature on his Twinfire stove. We managed to find a BYOB restaurant which led to more red wine consumption. From left - Rod Tinnemore, Dave Misiuk, Amanda Aldridge, John Ackerly, Norbert Senf, Ellen Burkhard and LIsa Rector. 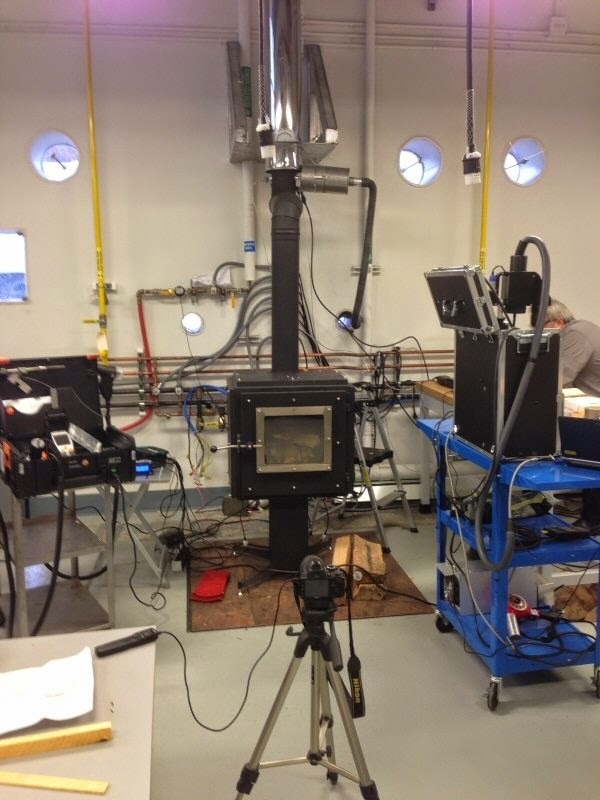 The Catalus Ventus shows incredible hot catalyst temps compared to the both the stack and the firebox. This was during start up, when it was emitting maximum smoke, but between the catalyst, the fabric filter, virtually no smoke came out the stack. Ivana Sirovica, a Research Fellow from Alliance for Green Heat, and Ben Myren, as Ben finished the final test of the week. Tom Butcher using the Wohler particulate analyzer on the VcV stove. 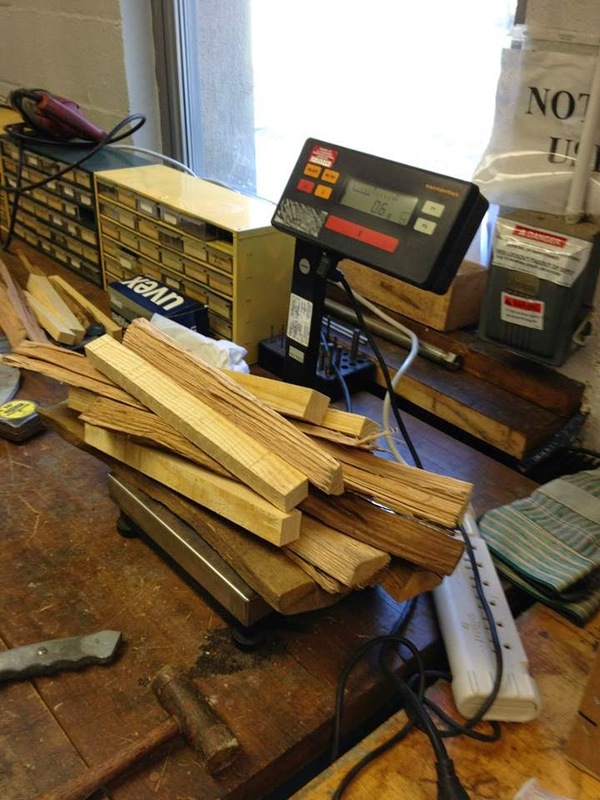 Because we used wood that was often above 25% moisture content, we had to deal with more moisture in our testing instruments. Underneath the VcV stove is where the magic happens, and mechanical valves automatically close or open the primary or secondary air, depending on what the stove needs to maintain a clean and efficient burn. THis stove maintained a steady low burn rate with beautiful swirling flames in the upper part of the chamber. 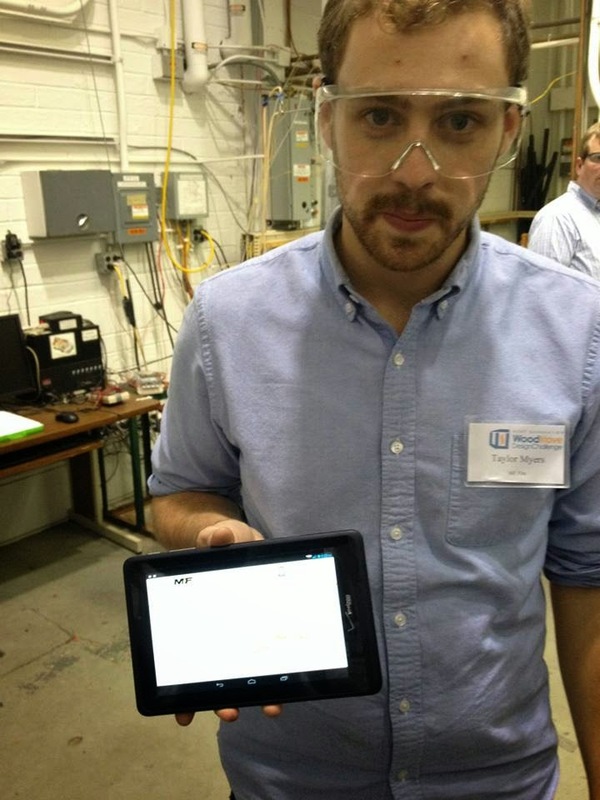 Ben Myren shows how his thermocouples could read the temperature in 10 spots of the stove at all times. The top of the flue could be 250, when the air entering the catalyst was nearly 800, and 1300 in the firebox. Brian Gauld, the owner of the VcV travelled from New Zealand, where there is also demand for automation that can improve stove performance far more than stoves are likely to perform when operated manually. Dr. Phil Hopke of Clarkson University and Mattian Woll of Testo. Our cord wood was kiln dried and then shrink wrapped so it would maintain a constant moisture content. 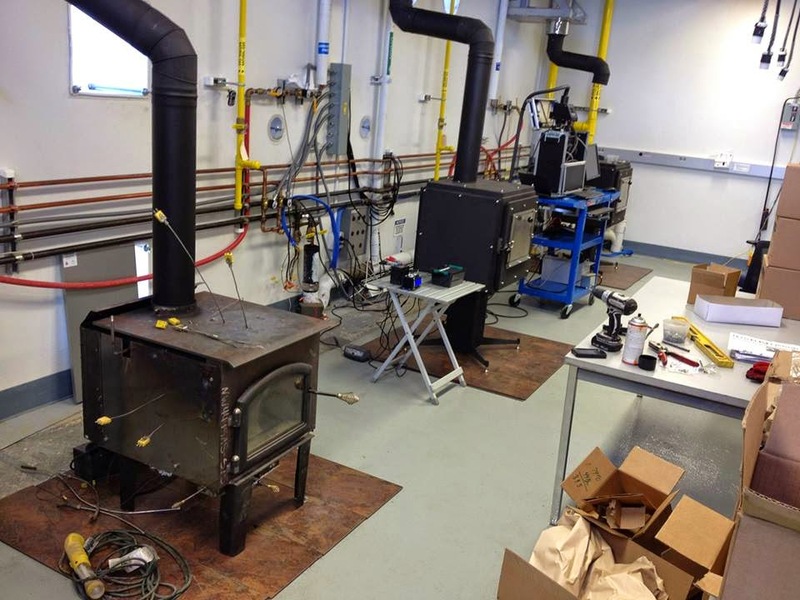 The wood was far wetter, on average, than wood used in EPA test certifications, which helped us assess how these automated stoves could perform with higher moisture content wood. Preparation of kindling for the tests. George Wei and Yussef were two of Brookhavens talented technicians. 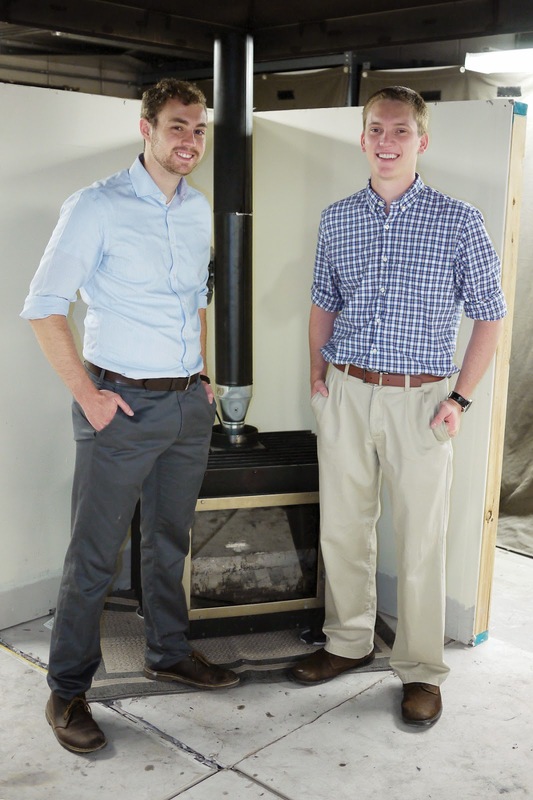 Both have worked on improving oil combustion systems, outdoor wood boilers and stoves. The last stove is taken out, and demonstrates the challenge of testing the same day as removing stoves that are still hot!